As you have doubtless noticed if you live in our neck of the woods, Arvada is blessed with hundreds of mature apple, plum and other fruit trees. So many, in fact, that it's pretty much impossible to keep up! Despite many homeowners' best intentions, thousands of pounds of fruit fall to the ground and rot in our gardens each year. Our "Community Orchard" program is a creative and sensible way for our neighborhoods to share their abundant fruit harvests and reduce waste. We show up when the fruit is ready, pick it and sort it, and divide the spoils between you, the owner, and our market and CSA customers (the community). The bad fruit goes to feed our chickens and compost piles. There is no unwanted fruit! All the Fruit You Can Eat - And a Clean Yard! 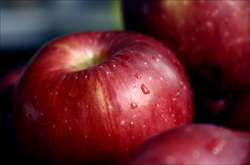 Just contact us with a description of your fruit tree(s) and/or bushes, and we will set up a time to visit your site. If it is a good match for our program, we will arrange to harvest your fruit for you each year as it ripens, at a time that is convenient for you. You get as much fruit as you want - we'll leave your bushels on your doorstep - and we make the rest available to others through our CSA share program and farm markets. Best of all, you are left with a clean yard and the satisfaction of knowing that none of your backyard abundance went to waste. Looking for Fruit to Eat? Check back here during harvest time... we will post updates as fruit trees begin to ripen and let you know what's on the way and where to find the bounty. We will sell fruit through our farmers' market booths at various locations, and if there is enough interest, we will set up fruit shares through our CSA membership program. We also welcome volunteer pickers - come help us harvest, and we'll pay you in fruit. We hope in the future to be able to offer a canning service through which we can preserve the excess neighborhood harvest and distribute it (to the owners and through our market stand) as apple butter, preserved plums and cherries, and other long-lasting and beautiful edible keepsakes. Imagine being able to enjoy delicious applesauce from your own backyard - without any of the hard work! To find out more or get involved, please use the Contact Us page to send us a note or give us a call. We look forward to hearing from you and sharing your fruit.